Statistical change-point analysis is concerned with detecting and localizing abrupt changes in the data generating distribution in time series. A long-studied subject with a rich literature, change-point analysis has produced a host of well established methods for statistical inference available to practitioners. These techniques are widely used in diverse applications to address important real life problems, such as security monitoring, neuroimaging, ecological statistics and climate change, medical condition monitoring, sensor networks, risk assessment for disease outbreak, genetics and many others. 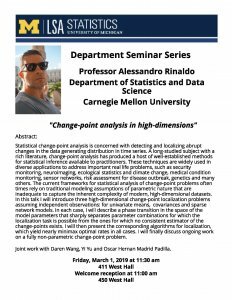 The current frameworks for statistical analysis of change-point problems often times rely on traditional modeling assumptions of parametric nature that are inadequate to capture the inherent complexity of modern, high-dimensional datasets. in this talk I will introduce three high-dimensional change-point localization problems assuming independent observations: for univariate means, covariances and sparse network models. In each case, I will describe a phase transition in the space of the model parameters that sharply separates parameter combinations for which the localization task is possible from the ones for which no consistent estimator of the change-points exists. I will then present the corresponding algorithms for localization, which yield nearly minimax optimal rates in all cases. 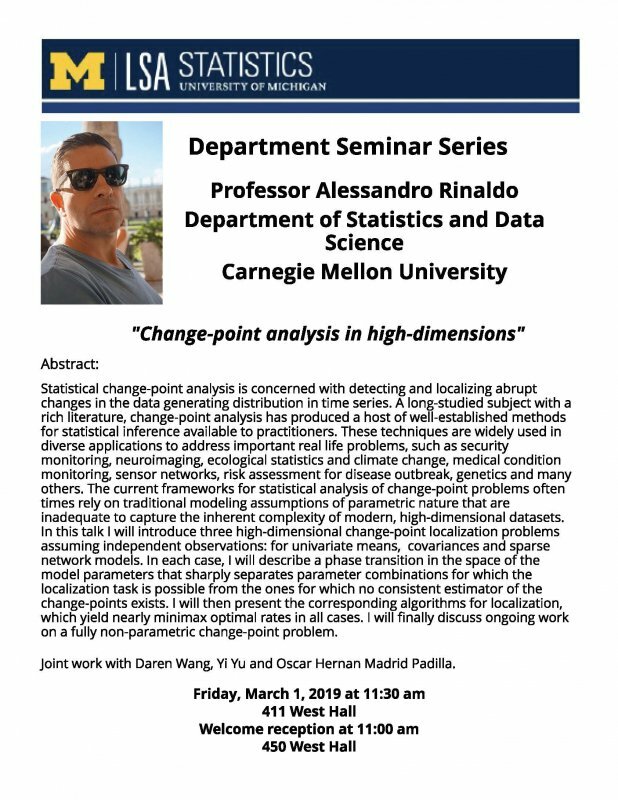 I will finally discuss ongoing work on a fully non-parametric change-point problem. Joint work with Daren Wang, Yi Yu and Oscar Hernan Madrid Padilla.